I've discussed fleet capture and fleet transfer in various bug reports dating back to 2016. I think fleet capture is a serious defect in the current combat model, because it makes it paradoxically risky to use fleets to actively defend your planets during an enemy invasion. IIRC, Bug King mentioned that the fleet capture trick was conducted over an independent world? I tried to replicate it with a puppet empire but failed. Can confirm that the method linked above is working, though. If you warp a fleet in just before enemy transports land, that fleet will defect to the invading player. Which is a reliable way to gift non-transport ships if both players are online. Updated front page. Latest map available courtesy of Wayward Device. The Imperium recognises and upholds a new alliance with the noble peoples of Windsor. Windsor is the Imperium's closest neighbour in the East descended from ancient Britannia, a similarly infamous power on old Earth whose sphere of influence rivalled even that of Rome in classical antiquity. Given the many interesting events that have transpired over the past few days, Imperial diplomats have thought it wise to make some new friends... ones who stand more in line with our ideals of employing ruthless pragmatism and utilitarianism to attain power at any cost. I offered to show the true path to power and dominion to the AOFK, in stark contrast to the False Light offered by the Hegemony. But they so foolishly turned it down in favor of other ideals like "loyalty" and "courage". It is a dark path, not one for the faint of heart. Now I shall take on a new apprentice, one who has already begun learning the secrets of economic might hidden in trade clusters. They shall also learn how to use that might to crush their enemies. May this Coalition stand for a thousand years. 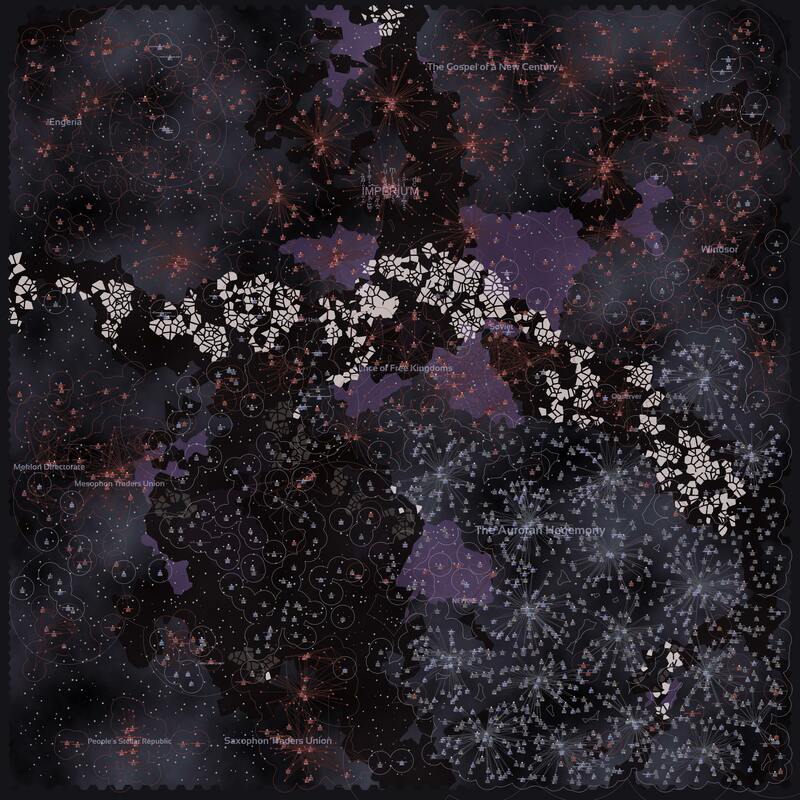 From what i have seen when a sector capital is taken there is a defection of 10-15 worlds (granted i have a small sample size), however i noticed that there was a much smaller defection when wayward device was handing over some gift worlds, including a sector capital that was close(~300ly) to the capital of one there clusters. And in my ongoing war whit L.W., Windsor, they managed to take a sector capital (~260ly from the other capital) and the total defection from that was 6 worlds. This seems like a useful defensive tactic, that can potentially slow down an invasion fleet, and make AFKing harder. If you redesignate ALL vulnerable sector capitals during wartime, the enemy will never get any defections. Well that was fun now wasn't it? My dear dear enemy Imperium has now been inticed into an early war with a very very very unsatisfied Wayward Device. With my abscence, I wonder what will happen? Long live the BUG KING!!! Here are some in action photos. It is the decree of this Imperium that all worlds outside of a cluster are hereby offered freely as gifts (genuine gifts, stated plainly and publicly here) to other players. The many past wars left lots of scattered, unconnected worlds cluttering up the map, sometimes even right next to other players' capitals where AHGHN beacons were captured (observe the tyranny!). They will be of much better use to smaller empires. That is, without doubt, the single largest mass deployment of fleets I've ever seen. While I captured Auroran trade hubs with a few fleets of 2-3M Minotaurs, Bug King was busy converting the entire SE to their empire color in the span of the 5 hours for which this war raged from Saturday morning to afternoon, world by world. What a day! Bug King truly remains a formidable opponent in any Era. @Finnian: Yes, from memory each of those little fleets had 100 Minotaurs, 100 Eldritch, 100 transports with 100 infantry. I spotted a few with the scouts posted all over Auroran space, only I didn't realize just how many they were!